The embattled actress poked fun at her legal troubles, arrests. Lindsay Lohan, who last hosted "SNL" in 2006, opened the show with a self-deprecating monologue. Lindsay Lohan's much-hyped return to "Saturday Night Live" opened with a razor-sharp monologue that did not shy away from the embattled actress' legal troubles. "I'm Lindsay Lohan, and I'm hosting 'Saturday Night Live'—I know, right?" The "Mean Girls" star, who reportedly begged producer Lorne Michaels for the hosting gig, tipped her hat to the "SNL" cast and crew for giving her a shot at comedic redemption. "I feel really lucky and grateful to be here tonight, and that's why I want to thank all of my friends at 'SNL,' who trusted me enough to have me back," Lohan said. Moments later, a security alarm blared when Lohan moved off the stage — a nod to her history of arrests. "Wait, so the alarm goes off if I leave the stage? I thought it was only if I leave the studio!" Within no time, Lohan's good-natured self-mockery got an able assist from cast members Kenan Thompson and Kristen Wiig. Thompson — who appeared with Lohan in promotional videos leading up to Saturday's appearance — administered a pupil test, while Wiig gave Lohan a pat-down in the guise of a supportive hug. "Are you searching me?" Lohan asked with mock idignation. "No ... I'm a lesbian now," Wiig replied — a wink at Lohan's ambiguous sexual orientation. "Been there, done that," Lohan dead-panned. When Wiig left for the wings, late-night host (and former "SNL'" cast member) Jimmy Fallon took the stage to announce the triumphant return of the "new old Lindsay Lohan" and praise her work in the Oscar-nominated "The Help." "I wasn't in that," Lohan said. Fallon was thinking of Lohan-lookalike Emma Stone, whose recent film roles may have once gone to Lohan before her career took a tumble — and who spoofed Lohan in a 2010 "SNL" sketch, ironically enough. Fallon then offered perhaps the most overt acknowledgment of Lohan's ongoing rehabilitation campaign, which has raised a few eyebrows among the media commentariat. "Everybody makes mistakes, but that doesn't mean you can't shake them off. You can do this—and if for any reason you can't, Jon Hamm is on standby as back-up host." Cut to the "Mad Men" star sitting in the front-row of the audience, putting up his hands up in protest. (Hamm's recent "SNL" appearances, like those of Justin Timberlake, have made him a fan favorite). Outside of the monologue, Lohan had the chance to flex some comedic muscles as Rapunzel in the parody "Real Housewives of Disney" and as a floozy psychic's assistant in an awards show sketch. But for the most part, Lohan's infamous public persona was the episode's most prominent recurring theme. As part of a bit set at a police station, Lohan played a tough-as-nails ex-con named Lindsay Lohan who intersperses her "scared straight" speech with references to her real-life film roles in "Herbie Fully Loaded," "Freaky Friday," "Mean Girls," and "The Parent Trap." 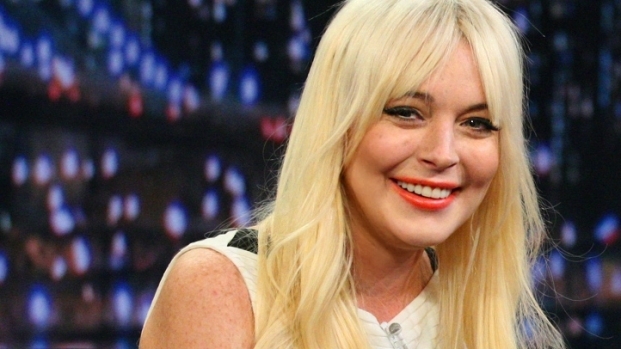 Lohan's alternate-reality criminal's nickname: Tweety Bird. Why, you ask?